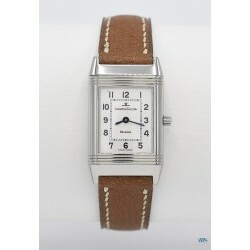 Reversible rectangular rectangular ladies' watch​ in steel​ with screwed back (signed and numbered). 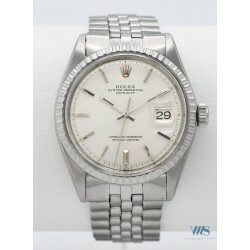 Two-tone silvered railway dial with bezel set with diamonds on both sides. Stylized Arabic numerals, blued steel sword hands. Leather strap with original Jaeger LeCoultre ​deployment buckle and an additional ostrich strap. Movement: Mechanical quartz winding caliber signed JAEGER-LeCOULTRE / 608 Swiss. 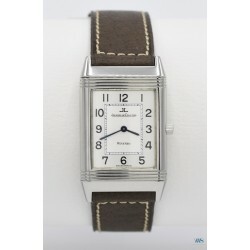 Elegant female "reversible" rectangular-shaped watch, steel case with striated bezel (signed and numbered back with marks). Silvered dial with two-tone railway in Art Deco style. Arabic numerals and blued steel sword hands. Two ostrich leather straps with JLC deployant buckle and a galuchat strap. 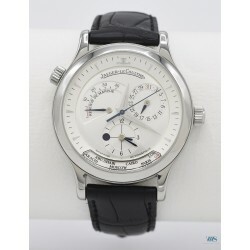 Movement: mechanical manual winding Caliber signed Jaeger-LeCoultre 846 Swiss. 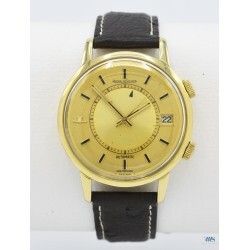 Reissue of the legendary 1970s respirator watch from the Zenith factory. 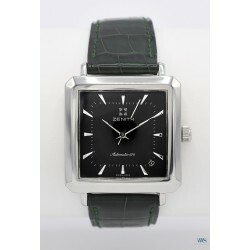 Square curvex steel case with "godronné" bezel and monobloc clipped back (signed and numbered). 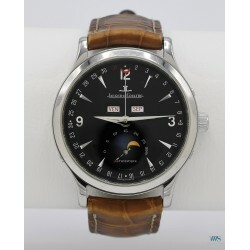 Black dial with applied indexes and chrome steel spear hands. Graduation of the minutes in the center and date between 4 and 5 hours. Zenith green crocodile strap with original pin buckle. Movement: Mechanical automatic winding caliber signed ZENITH / Elite 670 Swiss. 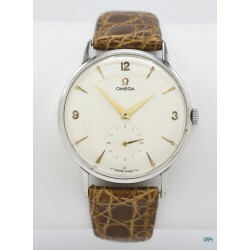 Very large aperture (for the time) classic steel watch, horn handles and clipped back (signed Omega, numbered). Silvered dial with arrow index and applied Arabic numerals, gold dauphine hands and small recessed seconds counter at 6 o'clock. Two straps: a chocolate PP crocodile strap with an attached pin buckle and a vintage Omega strap. Movement: Mechanical manual winding caliber signed OMEGA/ 30 T2 swiss. Unisex sports watch from the Pasha range in brushed steel with smooth bezel and 8 screws back (signed and numbered). Blue metallic dial with applied stick indexes and skeleton steel hands, window date between 4 and 5 o'clock. Protection of the crown with a cabochon specific to the model. Stainless steel strap with invisible deployant buckle (short). 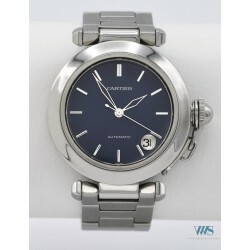 Movement: mechanical automatic winding caliber signed CARTIER / 047 Eta 2892 Swiss. 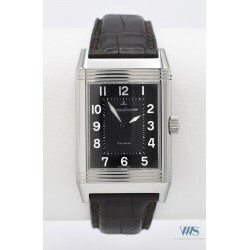 Rectangular men's watch with reversible steel case, ribbed bezel and unengraved clipped back (signed and numbered). Black dial with guilloché center railway. Arabic numerals and luminescent skeleton sword hands. Jaeger-LeCoultre chocolate crocodile strap with original deployant buckle and two leather strap. Movement: Quartz winding caliber signed JAEGER-LeCOULTRE/ H 1137 Swiss. 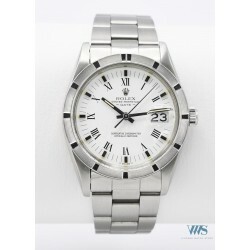 Rare lady sports watch in steel with smooth bezel, screwed back and crown (signed and numbered). Black dial with applied indexes and luminescent spatula hands. Date at 3 o'clock with Cyclops magnifying glass (sapphire crystal). Rolex Oyster strap in steel with original deployant buckle (72130) and a leather strap. Movement: mechanical automatic caliber ROLEX / 2235 Swiss. Sports watch that has become unisex with a fluted bezel called Thunderbird. Brushed steel case with screwed back and crown (signed and numbered). 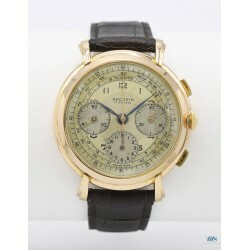 Creamy coloured railway dial with applied indexes, luminescent dots and hands and Roman numerals. Date window with cyclops magnifying glass at 3 o'clock (Plexiglass glass). Rolex Oyster steel strap with original deployant buckle. 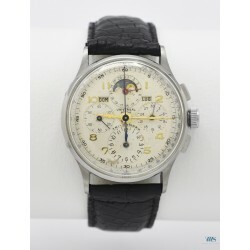 Movement: mechanical automatic winding caliber signed ROLEX / 3035 Swiss. Men's sports watch in brushed steel with fluted bezel. Screwed back and crown (Signed and numbered, 4th quarter 1970). Silvered metallic dial with applied indexes, tritium dots and luminescent skeleton hands. Cyclops magnifying glass date by window at 3 o'clock (plexiglass glass). Jubilee steel strap with vintage Rolex deployant buckle. 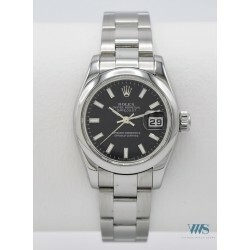 Movement: mechanical automatic winding caliber signed ROLEX / 1570 Swiss.